After station close, there is a tradition that we participate in down here at the South Pole. Everyone gathers together and watches the movie "The Thing". I have heard about this tradition for years, so I was very excited to actually be able to participate this time around! In fact, there are three movies called "The Thing", and we watched all of them. It took around six hours, but it was a ton of fun. The original version was made in the 50s, and that one actually takes place at the North Pole. We started with that one and then went on to the 2011 version which is actually a prequel to the 1982 version by John Carpenter, which we finished with. The last two actually take place in Antarctica which is why they have become traditional movies to watch. The one thing I get a huge kick out of is the fact that it is pretty much taken as a given, at least in the new two movies, that Antarctic stations have dynamite and flame throwers... I have been looking around, but I haven't been able to find either, and I don't know what we will do if we get invaded by aliens! Since we closed the station last week, we have started to settle into our winter routines. Our station responsibilities have shifted a little bit over the past week. During the summer, everyone has to take turns cleaning their shared bathrooms once a week, and the rest of the station is mostly taken care of by the stewards. Since we have a large population drop during the winter, there is only one steward, so we split all the cleaning responsibilities into different groups around the station. Each week groups shift change responsibilities and we have a different area of the station to clean. We started this new schedule this week, and it hasn't been too bad. I have a great group, including my IceCube colleague Martin and the RAs Doug and Adam. We also take turns now washing dishes, but given the number of people on station, that should only happen once every month and a half or so. I did my first turn in the dishpit this last weekend. It turns out it was a lot more work than I was expecting! I think I am going to try to volunteer some to help out more so it is not so bad for others. It is actually pretty common for people to volunteer in the dishpit, and I think I now see why. If you have more than one person there, it makes things much easier! Other than that, things are going well. I got a little behind on some of my winter projects last week due to station close and a few other things we had to do with the detector, but I have been doing well this week. I started some language studies this week: French and a bit of Spanish review on Duolingo. If anyone is interested in learning or refreshing a foreign language, you should friend me on Duolingo so we have that extra level of competition. It will help us keep each other motivated, I think. My username there is Hanavi. One area that I am making some good progress in is reading. I have been reading a ton, mostly physics papers and books, but I have an extensive reading list that I am hoping to put a dent in this winter, and I have started on one of the bigger books on the list: War and Peace. I don't read as much as I would like. When I talk to people, I generally find that they have either read way more or way less than I have. I tend to be somewhere in the middle. I also tend to read slowly at times, but that usually isn't an issue as I can be a very patient individual, but War and Peace is a long book. It may take me a while to get through. I have read some long books before, so as long as I don't get bored, this one shouldn't be a problem... We'll see if it keeps my attention! I have also started settling into a violin practice routine. I even picked up the trumpet and guitar for a few minutes yesterday. Unfortunately, after about 15 minutes, my lips were so tired and sore, I had to put the trumpet down. Similarly, I don't have calluses on my fingers any more so the guitar playing didn't last as long as I would like, either. I figure if I can do 15-20 min a day for the next couple weeks, I will be in a better place for both, and before too long I will be able to play for an extended period of time again. On a bit of a personal note, my sleep schedule has been a little weird. I am a bit of a night person, but that really shouldn't make a difference here, except that I have started to move into a night schedule. I think I would just prefer a longer day, so my schedule keeps moving later and later! Until recently, I have tried to stick with a fairly normal schedule due to meal times, but that has started to slip some. Given the nature of my responsibilities here, I do have some flexibility in my schedule, but I am not quite sure, how far I want to let my schedule flex. Besides meal times, I would like to be awake for the internet which is only up a few hours a day, and I don't want to miss out on some of the social activities. I suppose we'll see how it all works out, so far it hasn't been too bad. So far, winter is going well. The sun is still up for a few more weeks, but the temperatures have started to drop. We have seen temps going down to below -50F with windchills below -80F. As long as I can stay productive, I think this will be a great winter! This table comprises the most fundamental particles we know about. 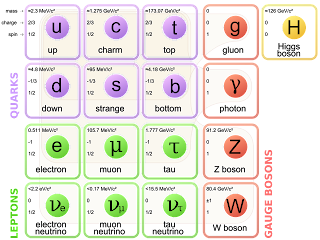 All of the particles we know about (excluding perhaps dark matter and dark energy) are made up of these fundamental particles. The important thing to know for our purposes is that there is this strange particle called the neutrino which is a fundamental particle related to the electron. In fact, there are a group of these particles called leptons. 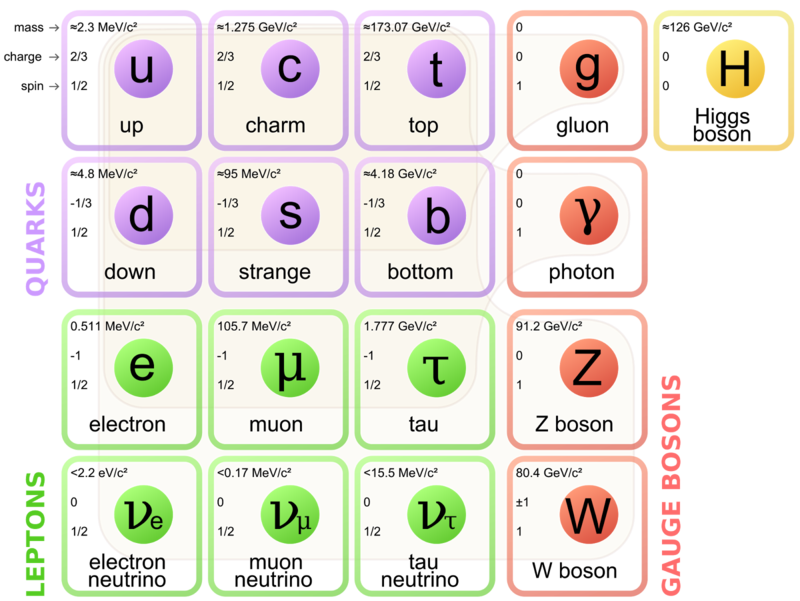 Three of these leptons are in a sense bigger and carry a charge: the electron, muon, and tau. For each of these particles there is a corresponding neutral particle called a neutrino: the electron neutrino, muon neutrino, and tau neutrino. We say these are the three neutrino flavors. These neutrinos are so "small" that we don't actually know how "small" they are. Where in this case "small" refers to mass. It is actually still an unanswered question in particle physics: What are the masses of the three neutrino flavors? That being said, IceCube studies these neutrinos in order to do all sorts of astrophysics and particle physics. 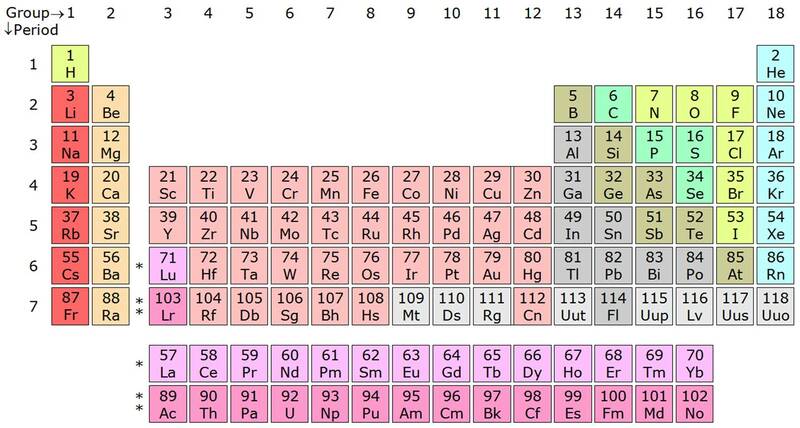 Notice that the highest energies that the LHC creates fall well within the range of the particles IceCube observers. In fact, one of our highest energy observed particles is estimated to have an energy 1,000 times greater than the energies that are seen in the LHC. I think it is safe to say that the LHC won't be destroying the Earth any time soon! To be clear, our atmosphere is constantly being hit by particles with more energy than the LHC explores, and IceCube is one of a handful of experiments that observes these particles to do physics. In fact, one thing IceCube hopes to do is to find the astrophysical origin of some of these particles. This is one of the interesting things about our detector. It can detect particles with much higher energies than we can explore with any man made particle accelerators. That is not to say that the LHC is not an essential experiment. In reality, it is an amazing experiment doing very important particle physics research. They explore particle interactions in a way that we cannot and are able to do physics that would be impossible with our detector. Similarly, the same can be said about IceCube. Our experiment is complimentary and explores physics regimes that would difficult or even impossible with the LHC. In IceCube we observe these high energy particles to do astrophysics and particle physics. We do everything from study the most energetic and violent astrophysical events involving exploding starts and colliding neutron stars and black holes to fundamental particle physics studying the properties of neutrinos and finally to the most exotic physics involving dark matter and even searches for magnetic monopoles. As it turns out, neutrinos are great for studying the universe! As I said before they are neutral particles, and they also very rarely interact with other particles. They also pass through the universe without interacting with magnetic fields that would otherwise alter their direction. This means that they can pass through the outer layers of stars and give insight into the processes that cannot be seen with normal telescopes. Unfortunately, this also makes them very difficult to detect. In fact, this is one reason we are at the South Pole! 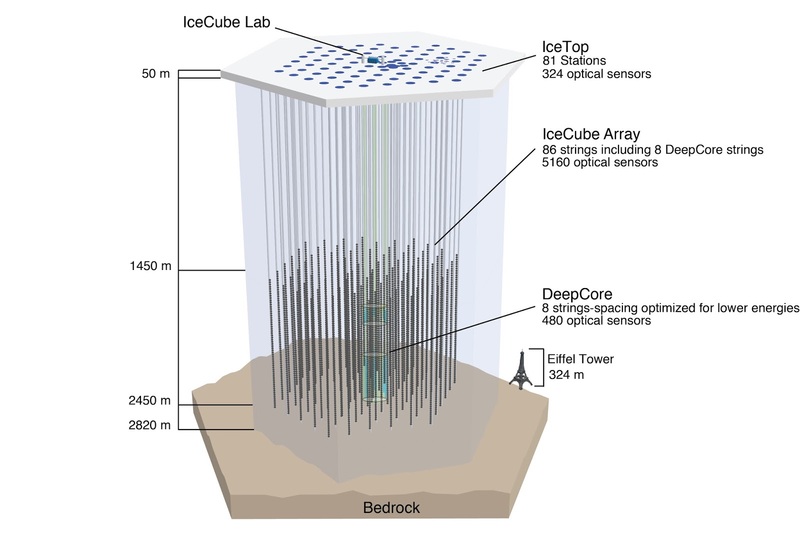 The IceCube Neutrino Observatory is located between 1.5km and 2.5km in the clearest ice in the world here at the geographic South Pole. Not many people realize this, but at the South Pole we are sitting on almost 3km or over 9,000ft of ice. At the depths of the IceCube detector, the ice is so clear, that it is clearer than any ice that can be made by any person on earth. It is clearer than glass. We have instrumented roughly one cubic km of ice with over 5000 very sensitive light detectors called photo-multiplier tubes. This is over a gigaton of ice that we use! The ice that is in our detector weighs more than all of the people on Earth combined! We need all that ice because the neutrinos are so difficult to detect. In fact, we don't even detect the neutrinos directly. We detect the results of neutrino interactions. For those who have heard of a sonic boom, we see something similar in our detector. Every so often, a neutrino will come through the ice and interact with an ice atom and create a new charged particle. This charged particle will move through the ice faster than the speed of light (in ice) and create a flash of light called Cherenkov radiation. This is just like when a plane moves faster than the speed of sound and creates a sonic boom. Now, I can tell some of you may be concerned because I said the particle was moving faster than the speed of light, and you may have heard that NOTHING moves faster than the speed of light... and you are correct! But that is only true in a VACUUM. In some other media, light slows down! In air or water or ice, light slows down enough that you can have a charged particle move fast enough to move faster than light in that particular medium, and this is the light we detect with IceCube. We detect the Cherenkov radiation generated by charged secondary particles created in neutrino matter interactions in the ice to do particle physics and astrophysics to better understand the universe around us... PHEW! As I said, we can use neutrinos to explore the insides of stars where telescopes cannot see, but we can also use neutrinos to explore more fundamental particle physics. As it turns out neutrinos are weird! Neutrinos can actually change flavor from say an electron neutrino to a muon neutrino or a tau neutrino. While it may not sound like much, this is a very interesting phenomenon to particle physicists and tells us something about how the universe works! IceCube is one of a handful of experiments that can actually measure these "oscillations". There are also questions about dark matter that we are exploring. The interesting thing about dark matter is that there is far more dark matter in the universe than normal matter. There is still so much we don't yet understand about dark matter, and since there is roughly 5 times more dark matter than normal matter in the universe, I personally feel it is a very important and interesting area of research. 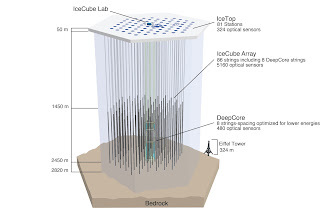 On top of this there are several other research projects being done using the data collected here at the South Pole using the IceCube Neutrino Observatory. So as a bit of a summary, we are doing some very interesting scientific research down here with the IceCube Neutrino Observatory. We participate in a diverse array of physics research using the data collected in one of the most isolated and extreme environments in the world located at the geographic South Pole using one of the largest scientific experiments ever constructed in over a gigaton of ice located between 1.5km and 2.5km deep in the clearest ice in the world! I have glossed over a great number of details in this post, but I wanted to at least get an overview of what is going on. Please feel free to ask questions in the comments, and I will do my best to answer them!